Recently, Co|So artist member Rose Leitner teamed up with Pauline Curtiss to create a 5-panel work of art inspired by the clients of the non-profit organization, Heading Home. The project was motivated by a branch of the organization called She4She, a panel of women inspiring women to unify, disrupt, and fuel change. Before they were asked to take part in this amazing project, both Rose Leitner and Pauline Curtiss were involved with Heading Home as volunteers and donors, helping the non-profit organization set up permanent housing for the clients and buy supplies essential to a good living environment. All hands and feet on deck for this project! Rose Leitner described this ambitious project as “really emotional and fulfilling.” In November the artists began with an important goal in mind: to incorporate direct input from the clients, donors, and Heading Home employees to display the wonderful village it takes to make this all happen. To make this an inclusive project of everyone involved in Heading Home, the artists went to one of the temporary homeless shelters and met with mothers and children. They explained their art concept to the clients and then passed out pieces of tissue paper and markers for them all to share their thoughts, hopes, and fears through words, phrases and pictures. These thoughts were later adhered to the art piece. The artists reveal this part to be one of the most emotional elements of the project. This was Rose Leitner’s first time collaborating on a painting, but she found it to be a rewarding and energizing experience. For every swirl or stroke of color each of them created, they later altered it together to make the surface of the painting equally theirs. The completed piece is comprised of five panels that each measure to be 4’ x 8’ x 8” and includes materials such as aluminum diabond, reclaimed wood, and plexiglass. 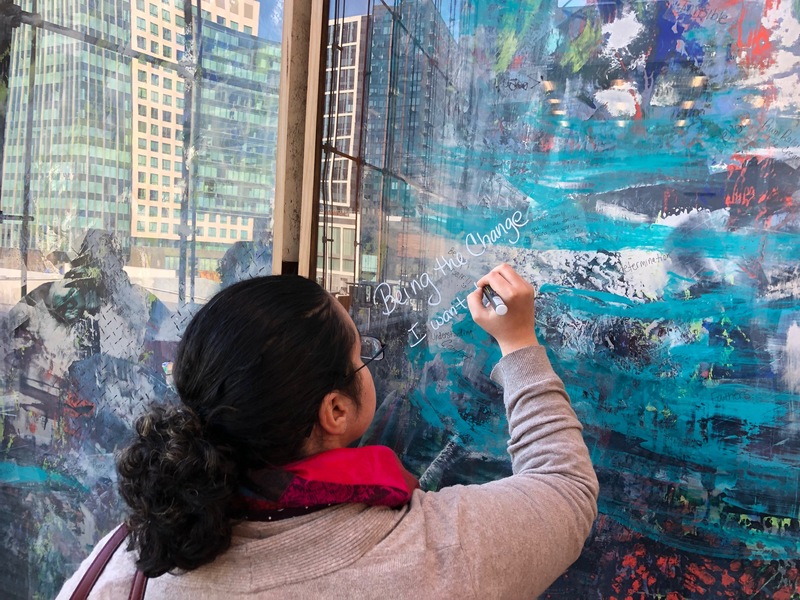 During the unveiling of the piece the artists asked the guests who were Heading Home employees, donors, and clients to write on the plexiglass with chalk markers.